At least he kept it brief? Hard water = Ice. Soft water = baby's tears. they give you like eight lines for a BRIEF description? 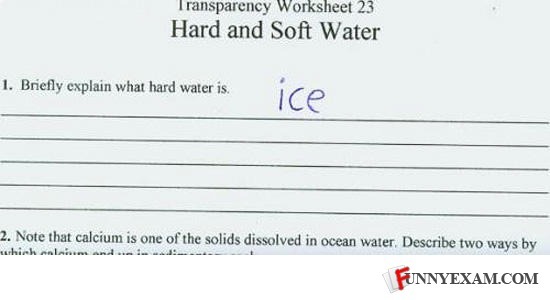 hahahah genious but.. hard water is water with calcium carbonate in it.. for the people questioning. Yo dawg! You should've handed that in! At least he followed the instructions. FTW!!!! Yo it's pretty much true! hard water is water which contains a lot of calcium carbonate. It is a question of precise wording. In Physics, ice is the solid state of water. Any molecule in its solid state by definition is hard. So the answer is correct, even if not the one expected by the teacher. Way to be retards and not realizing the toast joke has existed before the internet. Losers. So that means soft water is water vapor, right...? Cuz Im Ice Ice baby! it sed brieflyy ha ! leh leh leh! the newborn king! LOL surcharges toehold...what kind of captcha is that? Is that brief enough for you?